This is the one of the best Kratom Extracts we offer, and it's available in limited quantities. This Maeng da 25x is similar to the Ultra Enhanced Indo product that is seen elsewhere, but this is manufactured under strict conditions and lab tested with each batch to ensure a completely consistent result time and time again. This is one of the Top Three sellers here at the shop, with Maeng Da 35x tied for second place with the Bali 20x. This is the one of the best Kratom Extracts we offer, and it's available in limited quantities. This Maeng da 25x is similar to the Ultra Enhanced Indo product that is seen elsewhere, but this is manufactured under strict conditions and lab tested with each batch to ensure a completely consistent result time and time again. This is one of the Top Three sellers here at the shop, with Maeng Da 35x tied for second place with the Bali 20x. This is also a very fine powder; it's not resiny or clumpy in any way. 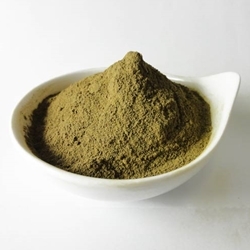 This 25x Maeng da powdered Kratom extract is a free flowing material that is extracted using only ethanol and purified water. It's easy for bulk manufacturers of Kratom products to opt for methanol and hexane because they're inexpensive. We don't let either of those anywhere near any of our extracted products. Whether it's a liquid extract manufactured under GMP conditions for consumption, or a resin extract intended to be smoked or for aromatherapy, ethanol and water are our only extraction agents. This Maeng Da 25x Private Reserve Extract comes with our 100% Satisfaction Guarantee because of how proud we are of the quality of this product. If you're interested in wholesaling any Kratom products, this 25x would be the product to buy. At 8% mitragynine content, a number of Kratom products could be made from this base powdered resin. Several customers who purchase this 25x extract from us sell it under various names, and one that we see most often is "Ultra Enhanced Indo". No need for fancy names for any of our products, especially for our Maeng Da 25x Extract. Yes, it carries my "Private Reserve" title because anything that I craft, manufacture, or grow personally gets that name. I have a ShamansGarden that has at least one of almost every plant I offer or sale here. But I also have a lab that is beyond FDA compliance, where I have tested and fingerprinted virtually every Kratom product on the market, and where I craft the Maeng da 25x Kratom extract as often as I can. It's always in batches of 1kg at a time, which is why it's often in such short supply. I will step up production for anyone interested in purchasing at least 5kg wholesale, though. I have multiple metric tons of Maeng da powder that's set aside just for this extract, so although I can't make it much faster, I have plenty of Kratom to make this extract from. All of our Kratom is verified authentic by Columbia or Wonderland-Labs, and we only choose the highest quality Kratom leaf and powder from verified sources. Nearly 2 decades in business, we have a wide variety of sources, and only the best sources make it through our strict screening process. Why trust Maeng Da 25x Powdered Extract from anywhere else?